Also keep in mind we centered a whole event around GLOW. We spent a good amount of time and money to put this event on. It was really good turn out and we promoted it a ton. If you are looking for a blow out event that your student will talk about for a long time, then this is your event! Zorb Ball (x2). A big rental purchase but keep in mind this was a huge event we put on during a Friday night. 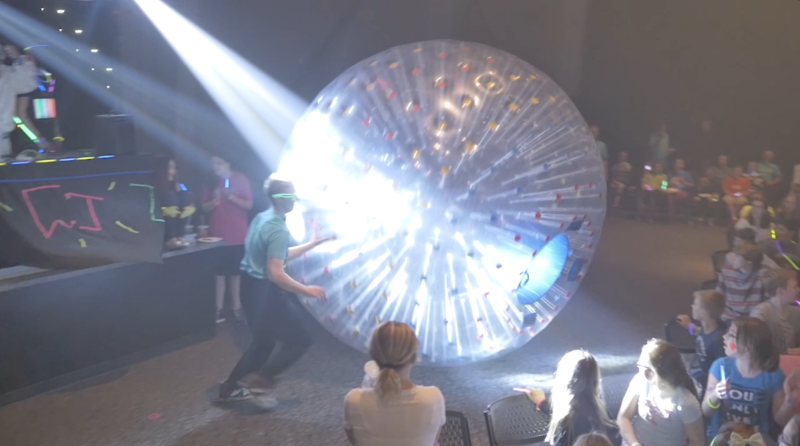 We had students using and playing in the zorb balls all night. Not just during the relay race. Baton (x2). Our theme for the night was glow so we used a huge glow stick. You can use a nerds rope or anything you can find. Tap Lights (x18). You can buy these in bulk HERE. You will need 18 total tap lights. 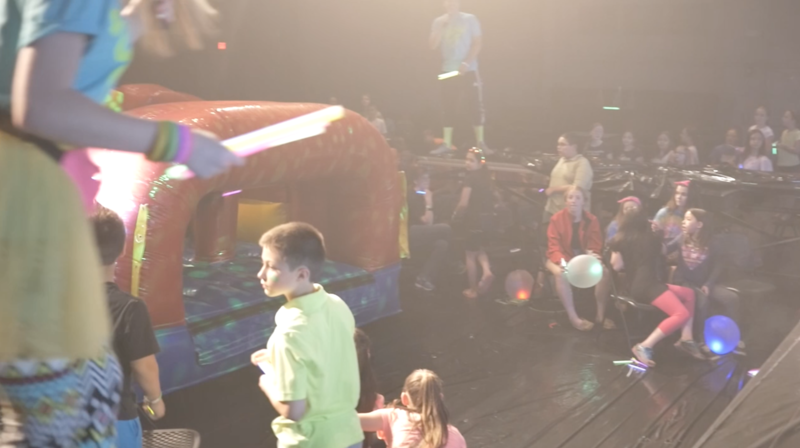 Inflate the Zorb balls and Inflatable Obstacle Course. Attach the tap lights to a wall. We used double sided tap, and it worked pretty well. Turn on all of the tap lights. The object of the race is to turn all the tap lights off. The idea of the game came from THIS game at Dave and Busters. We don’t have the ability to have them turn on and off, so we just decided they would turn them all off instead. You will need two teams of 3 people. Once you have them, determine who will run each part of the relay. There are three parts of the relay. 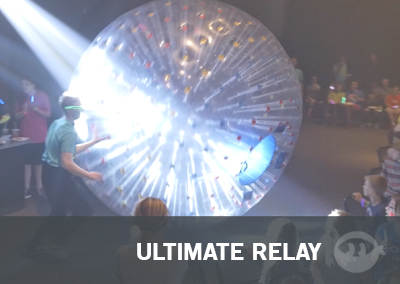 Contestant must get into the Zorb ball with the baton, and roll around the backside of the room to the front of the inflatable obstacle course. They must hand the baton to the next contestant in the race. 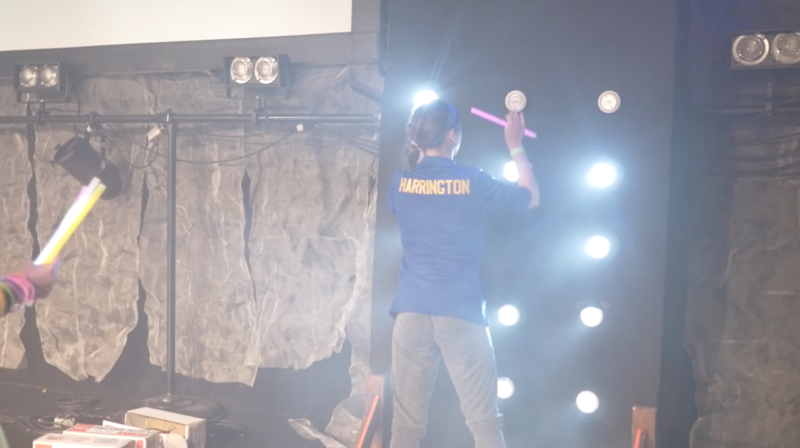 The contestant must run through the obstacle course with the baton, and hand it to the next contestant who is waiting for it. The contestant must turn off tap lights attached to the wall. The first team to complete each leg of the race is the winning team.